GROUND ZERO PLUS 1215 D AYS,--New York, NY, Sunday, January 8, 2005--Terrorism and Vigilance are at odds in Montana and Wyoming. While the war in Iraq rages as America struggles to install the first free election in that country's modern history, another battle between "insurgents" and "American troops" is underway in two of this nation's notable western states. 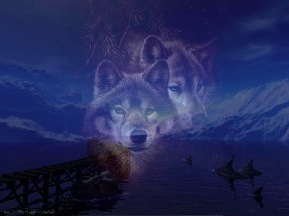 At the center of the tsunami storm over who has the right of ownership to the land is the grey wolf. Wolves and ranchers have never gotten along well. Wolves like to eat what ranchers manage, such as cattle and sheep. This combat between humans and wolves isn't new. It started in 1631 when colonists trying to tame North America declared war on the wolves. That battle of who was in charge of the land raged to the point where wolves reached the state of extinction. In the 1930's and 1940's, the noted animal conservationist Aldo Leopold called for the protection of wild creatures under what he called "land ethics," a proposal that humans and wild beasts have somewhat equal rights, and the wholesale slaughter of a species was wrong. In 1973 America passed the Endangered Species Act. The wolves were on it. Yellowstone Park, one of the world's great natural wonders, was virtually without wolves. The Fish and Game department "reintroduced" about 20 grey wolves into Yellowstone Park, which is in the wolves feeding range of Montana, Wyoming and Idaho, in 1995. 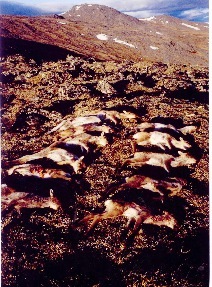 It was hoped the wolves would thrive and that an abundance of game--deer and elk--would serve as their feeding source. The wolves prospered. Today, there are more than 500. A mature wolf weighs between 50 and 100 pounds and its ranging territory extends from twenty to two-hundred miles, depending on the density of food. Despite the deer and elk in Yellowstone, the ranchers' lambs and cattle offered a tasty tidbit. As the insurgents are in Iraq, to a farmer a wolf is a threat. Killing a lamb or cow is like planting a bomb under the farmer's house. Not only does the dead livestock cost the rancher the price of that animal, but also all its future offspring. Back in the "old days" a rancher spotting a wolf on or about his or her land would "lock and load" and fire at will. No one gave his "right to kill" a second thought. Essentially, the wolf was part of the rancher's "free fire zone." He was a "known Terrorist." Similarly to the American troops in Iraq, the right to shoot a Terrorist running at you with a bomb strapped around his or her waist can be likened to the right of the rancher to protect "his" land from the ravages of the "Beast of Wolf Terror." That all changed in 1973. Stiff penalties were imposed for "killing a wolf," but the problem of their attacks were minimal due to the strangulation of the wolf population over prior decades. One could say by killing all the Terrorists that Terrorism waned from the rancher's viewpoint. The repopulation of Yellowstone brought Terrorism back to the rancher's doorstep. Only this time the rancher was hobbled from protecting himself and his herd. Under the Fish and Game guidelines for shooting a wolf near a rancher's herd, the wolf had to have "his teeth in" the animal. Following the letter of the law, a rancher had to wait until his livestock was attacked before reacting. This would be similar to American troops in Iraq being required to hold their fire until at least one American was killed by the enemy. Then, and only then could they open fire. In thirty days, the old rule of "teeth in" the livestock is being relaxed. 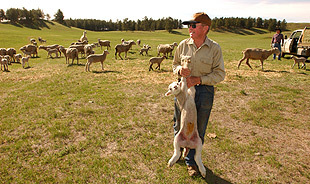 The new ruling allows the rancher to shoot if he "believes" the wolf is in the process of an attack. Obviously, this is a bit absurd. A wolf by nature is in a constant state of attack. It is a Sentinel of Vigilance in that sense, poised always to leap and rush after a meal. Even when a wolf sleeps it has its ears cocked. If an overweight rabbit were to hop by a pack of sleeping wolves, odds are it wouldn't make it to its destination. In combat, the Rules of Engagement always seem blurred. At what point do you have the right to fire upon what you think is the enemy. Personally, I have trouble with that distinction. A veteran of more than 100 combat missions in Vietnam, I discovered the more combat you engagein, the the quicker your trigger finger. Many times in a guerrilla war such as Vietnam or Iraq, the difference between a civilian and combatant is not how they dress or appear. A child or woman can run towards you yelling for help and have a bomb strapped around his or her chest, or be carrying a satchel charge. You become edgy about waiting too long to fire, especially if you've witnessed what appears as an innocent suddenly turn into a Terrorist and blow up your buddies because they mistook or misread the enemy as a civilian. So it is with the wolves in Montana and Idaho. Now, a rancher can "think" the wolf is about to attack and justify killing it. Before the new ruling, he or she had to produce evidence of teeth marks in the carcass or body of the livestock. Now, he can simply say: "Yup, that old wolf was about to rip out my prize bull's neck." The grey wolf line between Terrorism and Vigilance brings up countless issues of the "ethics of war." For example, at what point does "interrogation" become "torture?" When does the act of "combat" become a "war crime?" Some might say the grey wolf has a right to the land that supercedes human rights. The evolutionary roots of the wolf trace back some 50 million years. The grey wolf as a species is more than one million years old, and came to North America 700,000 years ago. Modern homo sapiens evolved only 50,000 years ago. Scientists thought North America became a home for humankind some 13,000 years ago, but modern data suggests it was 50,000 years ago. This begs the question: "Who has first right to the land?" Evolution is all about the survival of the strongest. America, as a nation, has incredible strength in relation to the rest of the world. It is the dominant alpha "wolf" of the global pack of nations. If America can tell Iraq how to govern itself, will it then impose its will on other nations because America doesn't like the way they do things? That's the thinking of non-alpha wolf nations. They see America as putting its sovereignty into a state of extinction, for when other nations impose themselves on fellow nations, the balance of power for all is in jeopardy. In the truest sense, the grey wolves are protecting the land for their children. A wolf has between 2-11 pups. It is a creature famous for its protection of its offspring. 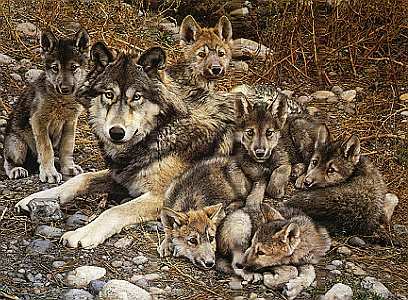 All the wolves in a pack, male and female, protect the pups. Legend and lore of children being raised by wolves is endless. 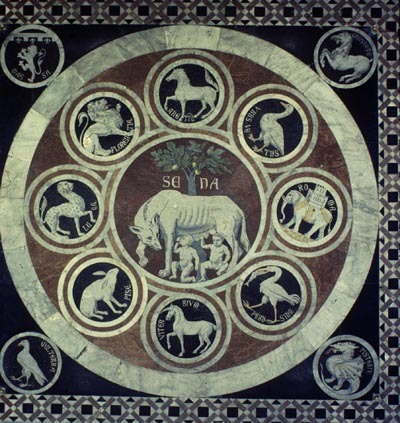 The great Roman state's symbol is of two children suckling a mother wolf. In the legend, Romulus and Remus were twin brothers. A great king feared the two children would threaten his rule of the land and threw them into the Tiber River to drown. But the children floated ashore. A she-wolf saw them, and instead of killing them, suckled them and kept them alive until a king's shepherd found them. They grew up to found the Great Roman Empire. The grey wolf's dilemma isn't an easy one to judge. He is a Terrorist to some and a Sentinel of Natural Vigilance to others. America is not unlike the grey wolf in that respect. To nations who oppose America's role in Iraq, the U.S. is a Terrorist. 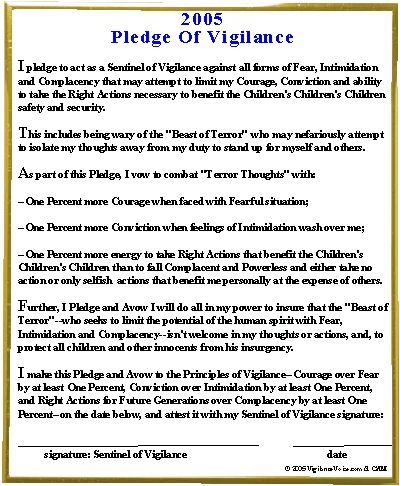 To those who believe someone must protect the children of the world from the threats of Terrorism, as the she-wolf did Romulus and Remus, America is a Sentinel of Vigilance serving to insure the rights of children from tyranny and oppression. As an observer and lover of animals, I am on the grey wolf's side. But, if I were a rancher concerned with the welfare of my livestock, and thought of them in terms of "children," I might see the wolf as a Terrorist. Regardless of which side you chose to stand for, there is a grey line between Vigilance and Terrorism. In this case, it is the grey wolf. In America's case, the grey line comes down to the bottom line intent of our presence in Iraq. If we are truly there to support and free the children and future children of that land from the hand of oppression and tyranny, then we are doing the right thing despite all the critics. I like to think that is our reason. Just as I like to think the grey wolf has the right to feed its children. Go To Yesterday's Story: "Terrorism's Thin Skin And How To Toughen It With Vigilance"